What greater resource could there be than the world’s oceans – a vast reservoir of mostly untapped power? 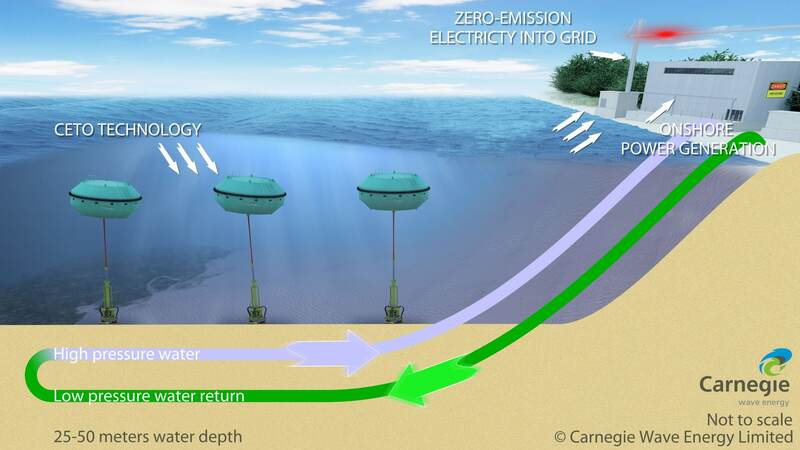 Named after the Greek goddess of sea monsters, Carnegie Wave Energy’s ‘CETO’ is a project that seeks to tap that power to create clean electricity and water. Having already been tested in a large-scale project in Western Australia, and with a base just set up in Cornwall, the offshore wave farm uses buoys almost two metres (six feet) underwater to drive hydraulic pumps through a pipe to a power plant on an island just over three kilometres away. It’s the first of its kind to generate power from the motion of the ocean whilst attached to an electricity grid. In 2017, the beast is about to be transported even deeper, generating four times the amount of electricity from within giant submerged buoys almost 20 meters (65 feet) wide, without the need for pumps. Then the pressure is on, as the force could cause automatic reverse-osmosis, yielding fresh water without using fossil fuels. As wind, waves and currents contain 300 times more energy than the world consumes, we’re holding our breath in the hope that this deep dive into the future will harvest huge amounts of zero emission electricity. Tags: Clean energy, Clean water, Hydroenergy, Pollution, Water.